The Edmonton Oilers stand at the top of the Pacific Division — at least for now. With a hard-fought overtime victory over the Anaheim Ducks on Saturday, the Oilers have moved into first, tied in points but two regulation wins better and ready to keep that top spot, thus earning home-ice advantage in the playoffs. The good news is, Edmonton’s ability to maintain postseason home-ice is now completely in their own hands. Both the Ducks and the Oilers have completed 78 games on the season. If the Oilers keep winning, Anaheim can’t catch them. The bad news? The Western Conference race is so close, should Edmonton lose a game or two, they could drop to fourth place just by sneezing the wrong way. In the end, it took resilience, tenacity and grit to get to where the Oilers are at. Here are seven things we’ve learned from their journey to this point. On Saturday, Cam Talbot officially tied Grant Fuhr’s record for the most wins in a single season by an Oilers goaltender. With his 40th win of the season, four games remaining and two full days rest before his next possible start, the odds are better than good that Talbot holds the distinction as Edmonton’s winningest single-season netminder of all time. That alone puts him in the conversation for the Vezina Trophy. He’ll be in tough to win the trophy as Sergei Bobrovsky (Columbus), Braden Holtby (Washington) and Devan Dubnyk (Minnesota) are also in the running and most have better statistics. The argument for Talbot is that he’s doing the most on potentially the weakest of the four respective teams. Typically a statement like this coming from an Oilers fan should be taken with a grain of salt. That said, at this stage, is there anyone other than Connor McDavid who should win these two awards? With his three-point night against Anaheim, McDavid now leads the NHL with 94 points. That puts him seven points up on his next closest Art Ross competitor in Patrick Kane and 10 points up on Sidney Crosby — the other candidate who tends receive the most consideration. The Hart Trophy is reserved for the player most valuable to his own team. While Talbot’s 40 wins and seven shutouts put him in the conversation from an Oilers perspective, from an NHL one, he’s not close considering two other goaltenders have 40 wins and both have accomplished the achievement in fewer games played. Even if Talbot was alone in his accomplishments, McDavid is so good, he simply overshadows what everyone else is doing. Huge comeback win for the #Oilers tonight! McDavid and Draisaitl connect on a beauty in overtime. Opposite of year’s past, this version of the Oilers has absolutely no quit in them. In previous seasons, when down going into the third period, or after being scored on first, the Oilers would fold. So too, when scoring first, they would have had an innate ability to let their opponent back into the game. This year, when they score first in a hockey game the Oilers are 29-6-3. They’ve learned how to close out a team. The Oilers can also make it seem like no lead is insurmountable. This roster can win a game at any time and at any stage in a hockey game. Their comeback in Saturday’s game is testament to that. In short, if you don’t score first, the Oilers have you in trouble. If you do, you better be looking over your shoulder. That feeling has to scare teams. It’s fair to say that the crux of the Oilers’ success has come at the hands of Edmonton’s top forward line of Connor McDavid, Leon Draisaitl and Patrick Maroon. They are leading the team in every category and picking up the slack for less-productive forwards like Jordan Eberle, Ryan Nugent-Hopkins and Milan Lucic. 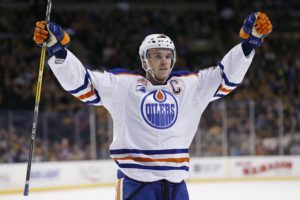 While Edmonton’s second line has the potential to contribute and a player like Lucic will pot one on the power play every once and a while, if Edmonton hopes to have prolonged success in the playoffs, Edmonton’s second line needs to do more than create chances, they need to convert them. This may be a weak spot Edmonton needs to shore-up. Edmonton’s blue line doesn’t employ a superstar, No. 1 defenseman. It doesn’t appear to need to. When working by committee, it’s apparent that the Oilers have a deep and playoff ready defense. They can play a big game, a skilled game and they can deploy a variety of well-rounded weapons. Oscar Klefbom has turned into a shooting machine ranking in the top-ten for NHL defensemen. Adam Larsson leads the Oilers in plus-minus for blueliners with a plus-20. He’s also top-15 in the NHL for defensemen in that category. In hits, Larsson is top-five and Eric Gryba sits just outside the top-25. Kris Russell ranks second in the NHL in blocked shots and Andrej Sekera seems to do everything else. It is becoming clearer and clearer that the Edmonton Oilers could be the team to come out of the Western Conference. Chicago and Anaheim are the two strongest teams with postseason positions and the Oilers have won the season series against both. That bodes well considering the Blackhawks and Ducks are also the Western Conference’s two hottest teams outside the Oilers. So too, the San Jose Sharks and Minnesota Wild have gone ice-cold. Two teams that were considered favorites in the conference are looking like teams that are vulnerable. Perhaps the biggest question mark is what happens versus the Calgary Flames? Edmonton has the regular season series in the bag, but Calgary is not the same team that they were to start the year. If the playoffs started today, Edmonton would matchup against Calgary in the first round. Pretty much any fan you ask would be excited to see that series. A lot of fans are also a bit leery of how that round might go. The Oilers are not. It doesn’t appear to matter who Edmonton plays in the first round. 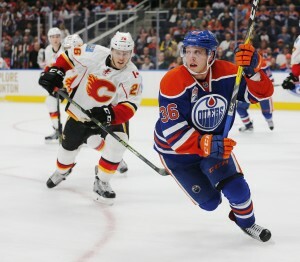 McDavid and company will be ready for anyone and above anything else we’ve learned on the way to Edmonton’s lead atop the Pacific Division, that seems to be the most exciting news.